Stockton Emergency Food Bank provides over 2,000 boxes of everything a family needs for Thanksgiving feasts on November 26th from 8 a.m. to 1 p.m. at their location 7 W. Scotts Ave.
“You will see people lining up from the door to the Amtrak station,” said Rebeca Knodt, executive director of the Emergency Food Bank. One of the food bank’s biggest fundraising events, the 9th annual Run&Walk Against Hunger will be taking place on Thanksgiving morning, Nov. 28. The main run begins at 8:30 a.m. The run is the food bank’s biggest fundraising event of the year with proceeds supporting food distribution and support of administration at the food bank. “We have to say we are very lucky for the community at large, they are very mindful of the people in need,” said Knodt. The Emergency Food Bank is one of 13 pantries throughout the county, but many students may be unaware of the assistance and resources they can offer. From cooking classes to disease prevention emphasizing diabetes and obesity, helping families and individuals in need with healthy meals and recipes, the organization remains humble. “We try to make whatever is available healthy options,” said Knodt in regards to available food to the needy. They visit over 60 sites throughout San Joaquin County, collaborating with assistance programs such the Women’s Center, St. Mary’s and the homeless shelter. “What you think is nothing, means a lot to somebody,” said Knodt. CalFresh Outreach which has a food stamps program is another huge resource they help people access. “The more we enroll the more income into the community,” said Knodt. There is misconception as to who is stricken with hunger. Many Americans may think it is the homeless or substance abusers, in actuality 77 percent of those in need are the working poor. Many of the receivers tend to be the elder community, who have worked all their lives, and due to government and economy difficulties have lost a majority of their social security. “We can all end up in the same fashion,” said Knodt. The Emergency Food Bank can only distribute once a month to each family or individual, which provides them with approximately three to five days of groceries. They are allowed to come and pick up Monday through Friday from 9-12 a.m.
“I wish we could give more, but we don’t have the resources,” said Knodt. More than 138,000 people per year visit this site, and 6 million pounds of food donated to those in need. “I’m feeling that I’m doing something, this goes a little beyond that its absolutely rewarding,” said Knodt. 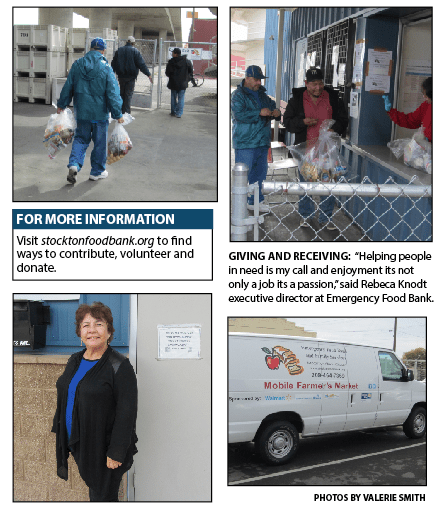 Visit stocktonfoodbank.org to find ways to contribute, volunteer and donate.